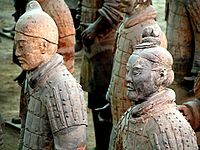 Following a widespread civil war during which the imperial library at Xianyang was burned,[p] the Han dynasty emerged to rule China between 206 BCE and CE 220, creating a cultural identity among its populace still remembered in the ethnonym of the Han Chinese. 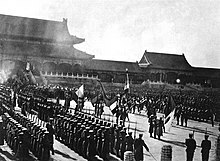 The Han expanded the empire's territory considerably, with military campaigns reaching Central Asia, Mongolia, South Korea, and Yunnan, and the recovery of Guangdong and northern Vietnam from Nanyue. Han involvement in Central Asia and Sogdia helped establish the land route of the Silk Road, replacing the earlier path over the Himalayas to India. Han China gradually became the largest economy of the ancient world. Despite the Han's initial decentralization and the official abandonment of the Qin philosophy of Legalism in favor of Confucianism, Qin's legalist institutions and policies continued to be employed by the Han government and its successors. China is home to at least 551 species of mammals (the third-highest such number in the world), 1,221 species of birds (eighth), 424 species of reptiles (seventh) and 333 species of amphibians (seventh). 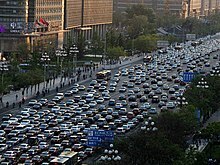 Wildlife in China share habitat with and bear acute pressure from the world's largest population of Homo sapiens. At least 840 animal species are threatened, vulnerable or in danger of local extinction in China, due mainly to human activity such as habitat destruction, pollution and poaching for food, fur and ingredients for traditional Chinese medicine. Endangered wildlife is protected by law, and as of 2005[update], the country has over 2,349 nature reserves, covering a total area of 149.95 million hectares, 15 percent of China's total land area. The Baiji has recently[when?] been confirmed extinct. 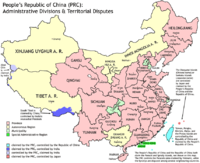 The People's Republic of China is the second-largest country in the world by land area after Russia, and is either the third- or fourth-largest by total area, after Russia, Canada and, depending on the definition of total area, the United States. [q] China's total area is generally stated as being approximately 9,600,000 km2 (3,700,000 sq mi). Specific area figures range from 9,572,900 km2 (3,696,100 sq mi) according to the Encyclopædia Britannica, to 9,596,961 km2 (3,705,407 sq mi) according to the UN Demographic Yearbook, and the CIA World Factbook. China has the longest combined land border in the world, measuring 22,117 km (13,743 mi) from the mouth of the Yalu River to the Gulf of Tonkin. 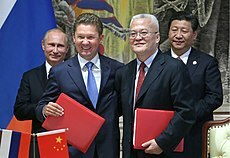 China borders 14 nations, more than any other country except Russia, which also borders 14. 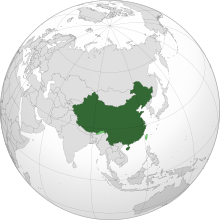 China extends across much of East Asia, bordering Vietnam, Laos, and Myanmar (Burma) in Southeast Asia; India, Bhutan, Nepal, Afghanistan, and Pakistan[r] in South Asia; Tajikistan, Kyrgyzstan and Kazakhstan in Central Asia; and Russia, Mongolia, and North Korea in Inner Asia and Northeast Asia. Additionally, China shares maritime boundaries with South Korea, Japan, Vietnam, and the Philippines. With 2.3 million active troops, the People's Liberation Army (PLA) is the largest standing military force in the world, commanded by the Central Military Commission (CMC). China has the second-biggest military reserve force, only behind North Korea. 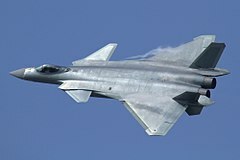 The PLA consists of the Ground Force (PLAGF), the Navy (PLAN), the Air Force (PLAAF), and the People's Liberation Army Rocket Force (PLARF). According to the Chinese government, China's military budget for 2017 totalled US$151.5 billion, constituting the world's second-largest military budget, although the military expenditures-GDP ratio with 1.3% of GDP is below world average. However, many authorities – including SIPRI and the U.S. Office of the Secretary of Defense – argue that China does not report its real level of military spending, which is allegedly much higher than the official budget. China is the world's largest e-commerce market, amounting to 42% of the global market by 2016. China's e-commerce market had online sales of more than $1 trillion in 2018, according to PWC. China's e-commerce industry took off in 2009, marked by the growth of internet giants Tencent Alibaba - purveyors of products such as WeChat and Tmall that have become ubiquitous in contemporary Chinese life. Tencent's WeChat Pay and Alibaba's Ali Pay have helped China become a world leader in mobile payments, which amounted to about $30 trillion in China in 2017. China is also second only to the United States in venture capital activity and is home to a large number of unicorn startup companies. In 2018, China attracted $105 billion of venture capital investments, amounting to 38% of global VC investments that year. In late 2018, the world's most valuable startup was ByteDance, a Chinese company; and the two most valuable AI (Artificial Intelligence) startups in the world were SenseTime and Face++, both from China. In 2017, China's State Council released its Artificial Intelligence Development Plan, which declared AI technology a priority economic growth and investment sector. In 2018, China created 97 "unicorns" - startups that are worth more than $1 billion - which amounted to 1 unicorn every 3.8 days. Chinese smartphone brands -- Huawei, Xiaomi, Oppo, Vivo, OnePlus etc. -- have captured more than 40% of the global market. In 2018, Huawei became the largest telecom infrastructure provider and also took the #2 spot from Apple as a smartphone vendor. Tourism is a major contributor to the economy. In 2017, this sector contributed about CNY 8.77 trillion (US$1.35 trillion), 11.04% of the GDP, and contributed direct and indirect employment of up to 28.25 million people. There were 139.48 million inbound trips and five billion domestic trips. China legally recognizes 56 distinct ethnic groups, who altogether comprise the Zhonghua Minzu. The largest of these nationalities are the Han Chinese, who constitute about 91.51% of the total population. The Han Chinese – the world's largest single ethnic group – outnumber other ethnic groups in every provincial-level division except Tibet and Xinjiang. Ethnic minorities account for about 8.49% of the population of China, according to the 2010 census. Compared with the 2000 population census, the Han population increased by 66,537,177 persons, or 5.74%, while the population of the 55 national minorities combined increased by 7,362,627 persons, or 6.92%. The 2010 census recorded a total of 593,832 foreign nationals living in China. The largest such groups were from South Korea (120,750), the United States (71,493) and Japan (66,159). As of 2012[update], the average life expectancy at birth in China is 75 years, and the infant mortality rate is 12 per thousand. Both have improved significantly since the 1950s. [t] Rates of stunting, a condition caused by malnutrition, have declined from 33.1% in 1990 to 9.9% in 2010. 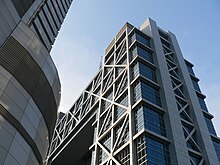 Despite significant improvements in health and the construction of advanced medical facilities, China has several emerging public health problems, such as respiratory illnesses caused by widespread air pollution, hundreds of millions of cigarette smokers, and an increase in obesity among urban youths. 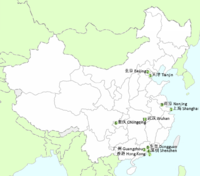 China's large population and densely populated cities have led to serious disease outbreaks in recent years, such as the 2003 outbreak of SARS, although this has since been largely contained. In 2010, air pollution caused 1.2 million premature deaths in China.
" Three laughs at Tiger Brook", a Song dynasty (12th century) painting portraying three men representing Confucianism, Taoism, and Buddhism laughing together. Clear data on religious affiliation in China is difficult to gather due to varying definitions of "religion" and the unorganized, diffusive nature of Chinese religious traditions. Scholars note that in China there is no clear boundary between three teachings religions and local folk religious practice. A 2015 poll conducted by Gallup International found that 61% of Chinese people self-identified as "convinced atheist", though it is worthwhile to note that Chinese religions or some of their strands are definable as non-theistic and humanistic religions, since they do not believe that divine creativity is completely transcendent, but it is inherent in the world and in particular in the human being. According to a 2014 study, approximately 74% are either non-religious or practise Chinese folk belief, 16% are Buddhists, 2% are Christians, 1% are Muslims, and 8% adhere to other religions including Taoists and folk salvationism. In addition to Han people's local religious practices, there are also various ethnic minority groups in China who maintain their traditional autochthone religions. The various folk religions today comprise 2–3% of the population, while Confucianism as a religious self-identification is common within the intellectual class. Significant faiths specifically connected to certain ethnic groups include Tibetan Buddhism and the Islamic religion of the Hui, Uyghur, Kazakh, Kyrgyz and other peoples in Northwest China. This page is based on the Wikipedia article China; it is used under the Creative Commons Attribution-ShareAlike 3.0 Unported License (CC-BY-SA). You may redistribute it, verbatim or modified, providing that you comply with the terms of the CC-BY-SA.